The internet is full of dubious essential oil advice. It can be really hard to know who to trust. Maybe you shouldn’t even trust me. But, I do have your best interests at heart so I really need to talk about essential oil ingestion. If one person stops ingesting on a regular basis as a result, I am happy. 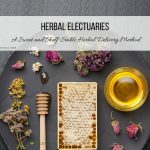 A qualified professional is a person who is a clinical aromatherapist (200+hours of training), and has taken additional coursework in aromatic medicine. Alternately, someone who already has extensive training in medicine, including anatomy, physiology, pathology, and pharmokinetics and has a clinical aromatherapy certificate may be qualified. The most important thing is, someone with this training giving advice in a book or article or blog post is not acceptable. No two human beings are alike. Whoever is giving you advice should meet with you personally, take a history of the problem, and take and review a complete medical history including any medications you are taking. The internet can’t do that for you. 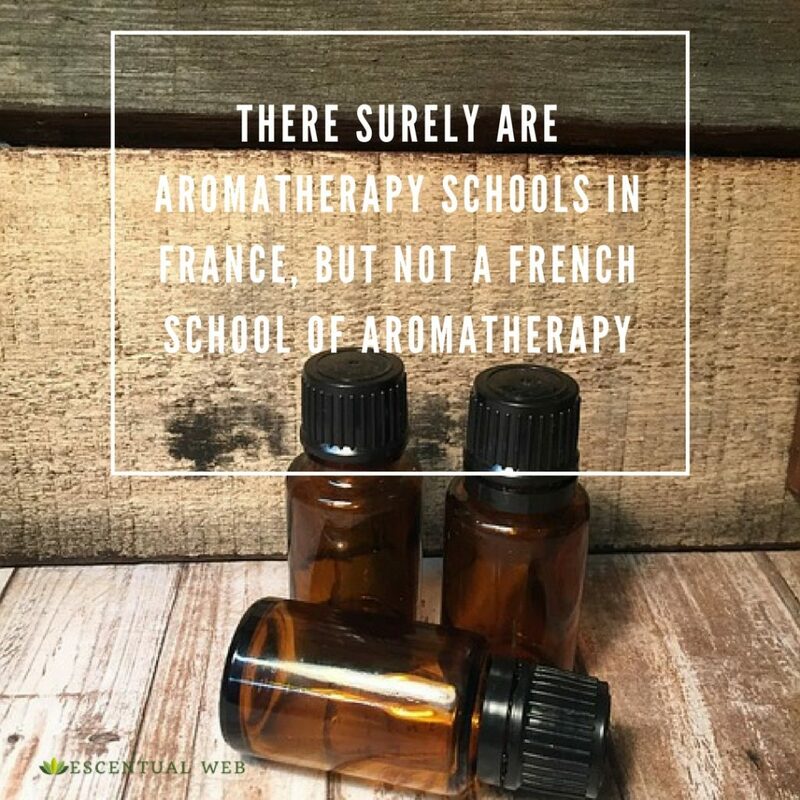 There are some who say they are trained in the French school of aromatherapy. They are usually referring to ingestion of oils when making this statement. There are surely schools of aromatherapy in France, but there is no French school of aromatherapy. Or an English school. Or a German school. The use of the term school here is as in a school of thought. Doctors in France sometimes prescribe essential oils, but that does not make it a national movement. A specific purpose is an ailment or condition that you would like to “treat” with essential oils. I put that in quotes because to say that oils treat a condition is putting them in the categories of drugs, which we try to avoid. That said, some will try to put them in the category of supplements, which is something you take to help your body do its job better. This is closer to the truth, except it implies regular use. Aromatherapy is best used as needed. Essential oils live in a gray area between drugs and supplements. I might only take a Vitamin D tablet on days when I did not get 15 minutes of sunshine. I might only roll lavender and peppermint oil onto my temples when I have a headache. 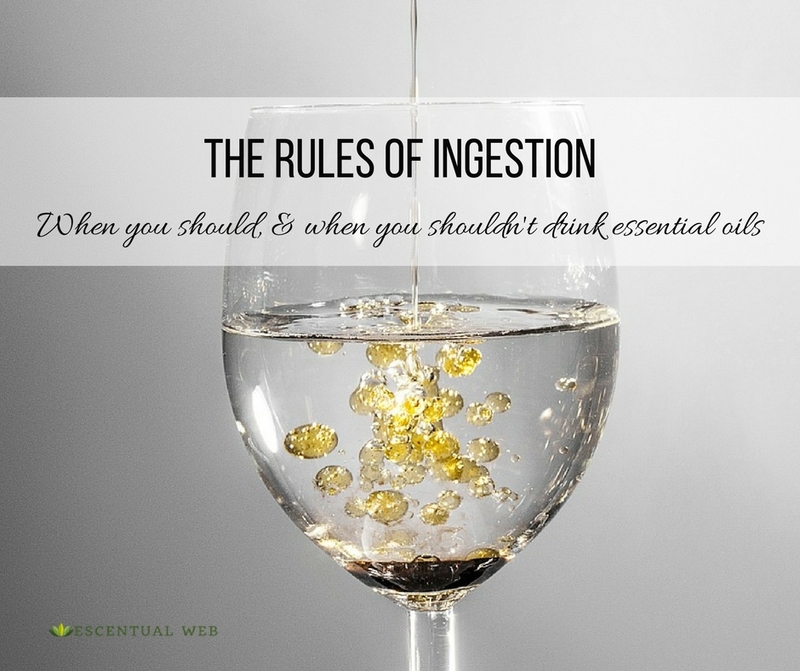 If all essential oils should be used as needed, then ingestion of oils should be reserved for those times when the condition is best served by ingested oils. Almost everything oils are good for work by inhalation (my favorite) or topically. There should be only rare occasions when ingestion is the better choice. It is not up to me to tell you when those times might be, it is up to a qualified professional. Essential oils are processed by the liver, much like drugs. We know that over the counter drugs like Tylenol can harm our liver when taken in larger doses for an extended period of time. We also have reports of people with kidney or liver damage as a result of a daily drop of oil in their water over a period of many months. Don’t be that person. If a qualified professional tells you to take something internally, only do it for as long as they recommend and then stop. What about oils that are GRAS? The FDA has classified some essential oils as GRAS, which stands for Generally Regarded as Safe. Some use this as an excuse for ingestion of oils. The problem is that they are taking the statement out of context. The FDA has approved some oils for use as flavorings in the food industry. The percent dilution is much less than in aromatherapy. The FDA does not require testing essential oils for use as supplements or drugs, therefore we cannot extrapolate their GRAS status to aromatherapy use. Hopefully whomever you are buying your oils from is supplying you with pure and unadulterated oils. 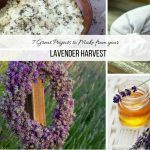 (FYI we have a post of our favorite essential oil companies). Pure does not take away the dangers of regular ingestion. Pure oils are composed of chemical molecules too. Some oils can be fatally toxic in small amounts, so please don’t let anyone tell you that pure oils are safe to ingest. When you read safety recommendations about essential oils, for example in Tisserand and Young’s Essential Oil Safety, you can assume the authors are talking about pure oils. It certainly would be a wasted effort for them to write 700 pages of advice that only pertained to contaminate oils. Safety advice applies to all oils. I want to end with a few photos I took recently (see above). I put a drop of German chamomile into a small vial of water, and another in a vial of fractionated coconut oil to demonstrate that oils mixed in water do not stay mixed together for more than a second or two. This means when you drink oils in water, by the time it reaches your mouth and esophagus, the essential oil is no longer dispersed in water and could cause tissue irritation or burns. Here is the interesting happy accident that happened. I left the drop that was well dissolved in about 10 ml of coconut oil on the counter for several days before getting around to disposing of it. The plastic vial had an etched ring around the edge from the essential oil. I left it empty but unrinsed a few days more, and look what I came back to! Now, I don’t know about you, but if something can do that kind of melty awful damage to plastic, what can it do to your insides? 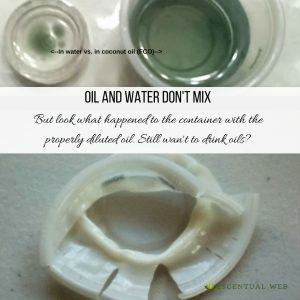 Remember, this was the container with properly diluted and dispersed oil! 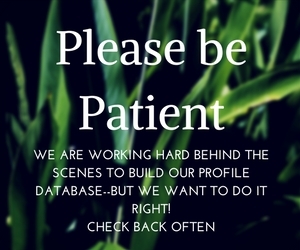 I know my answer, and I hope that I have convinced at least one person that ingestion may have its place, but it is not on Pinterest, or a blog post, but in the hands of the pros.